Similar to what Vince Gill has in his music room. I use a bookcase in my music room. It has 6 shelves plus the top. Hmm.... keeping stuff in drawers? It'll never catch on. Building a couple like that will be my next project. Great idea! 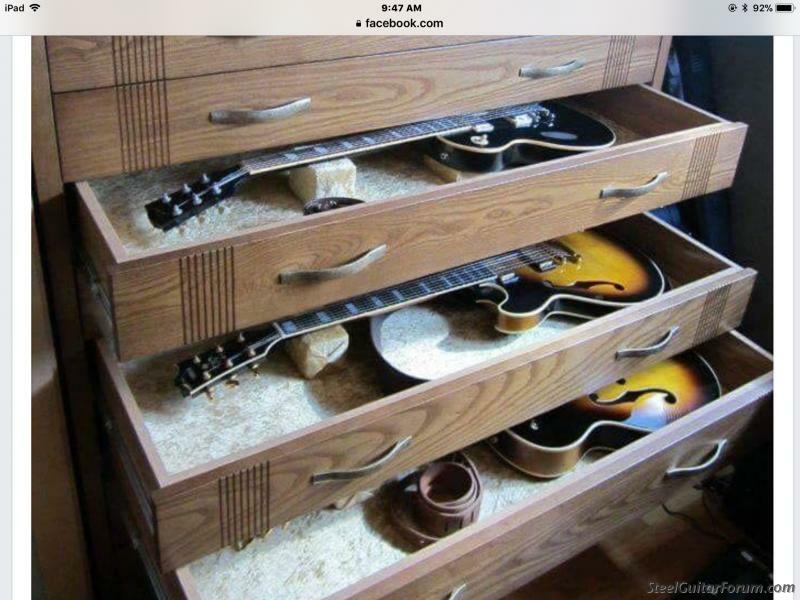 I kinda like the drawer idea, except for the possibility of banging them into the top when getting them out. I just watched a Vince video where he did exactly that, lol - banged the headstock into the top of the drawer. Maybe stand up drawers, kinda like a gun safe, something like that may be more practical. You still need a lot of beds to store the cases under . What is the attraction instead of storing them in cases? Or, if you have a dedicated music room, hanging them on the wall so you are more likely to see them and pull them down occasionally.